A few days ago I showed the initial stages of my print of the Louisiana Waterthrush and Ebony Jewelwing at the Wissahickon. At end of this post I'll show the finished print. 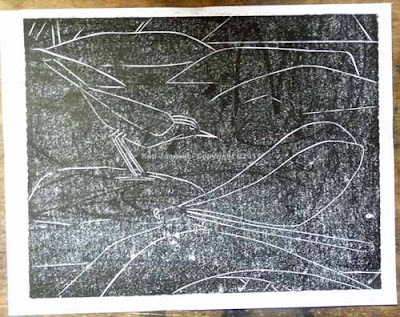 For now though I'd like to show what came before the initial stages of the print. 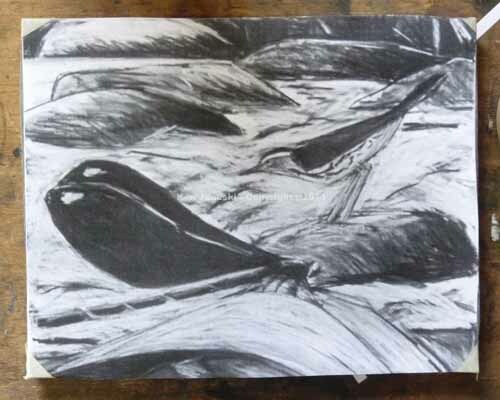 That was of course the charcoal drawing that I also showed earlier. But it too had its own origins. Some of them are at top where I show two pages from different sketchbooks. Both pages are all fieldsketches. The one on the left is over a year old. 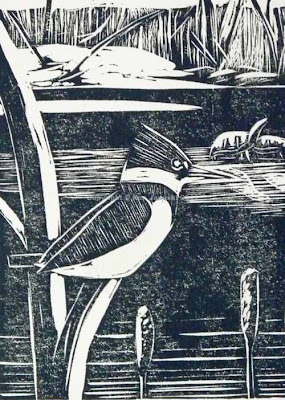 The main subject is a Red-bellied Woodpecker falling off a tree, along with a large piece of bark, done from memory. Obviously it happened too quickly for me to sketch it as it happened. There's also an overworked sketch of an Acadian Flycatcher. But I didn't even remember doing the dragonfly. Only the stigmas indicate to me that this is most likely another female Ebony Jewelwing. The page on right is from a few weeks ago and shows a quick sketch of the Louisiana Waterthrush and the Bbony Jewelwing along with some poorly drawn other birds. None of these are anything to write home about. But I think they show the value of a sketchbook in developing paintings and prints. The quick watercolor above is also one that I posted here earlier. It's done using Caran d'Ache Neocolor II crayons and is based on the field sketch at top as well as my visual memory. As you can see there is more of a diagonal to the pose than in the fieldsketch. But that is how I remembered it. This waterthrush seems to always have his behind up in the air, pumping all the time. So I wanted to capture that and I think I did a better job here than in the original fieldsketch. 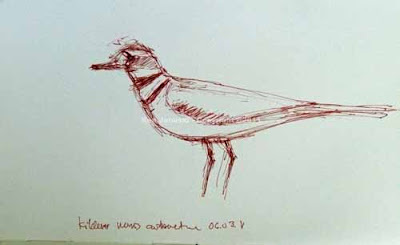 I did see the same bird once or twice after the field sketch and he was again in the same pose. What's interesting to me about this though is that I used this pose, as well as the made up rocks and water, which only approximate what I saw, as the basis for the charcoal drawing and finally the new print. Some people may wonder why in the world I'm beating this waterthrush/damselfy/horse to death. Mainly because I loved reading about artistic process when I was young and still do. 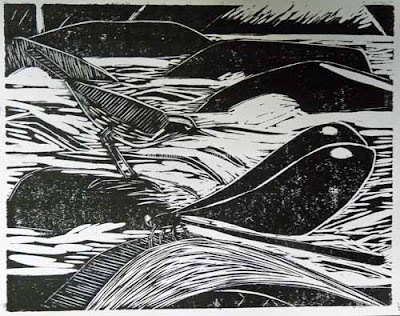 The other reason is that I feel like I'm finally accomplishing what I set out to do when I started using birds as subjects in 2006: create ambitious works that included them as subjects. 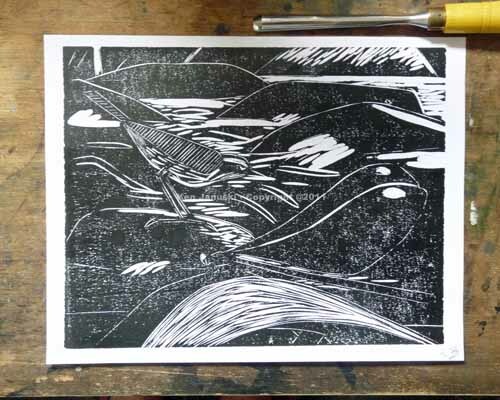 The combination of fieldwork, artistic creativity in designing the final composition, and then cutting the lino all add up, at least to me, to something that matches my ambition for what art should do. 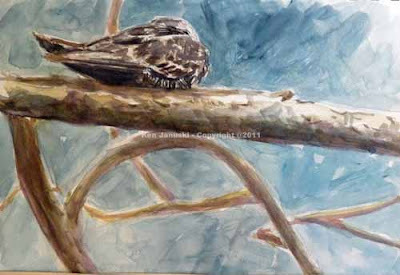 As an added benefit, and one I never had as an abstract artist, it allows me to portray the natural world that I love. Above is the final edition. 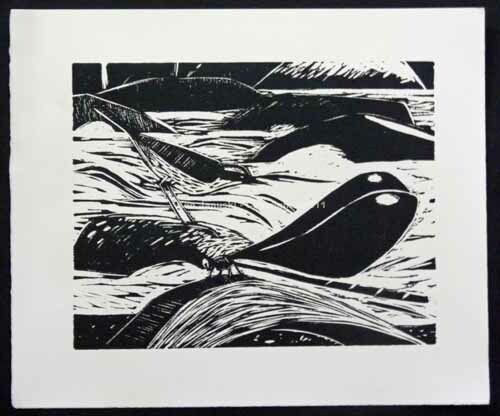 This is print number 4 of 10. There are also two artists proofs. It was a beautiful morning for field sketching but late this afternoon I found some time to return to the Louisiana Waterthrush/Ebony Jewelwing linocut. Above is version 15. I'm nearing the end. Most likely a few more tweaks then on to an edition on good paper. The current proofs are on cheap printer paper so the ink doesn't always look as good as it will on the final printmaking paper. I'm still deciding which paper to use for it. 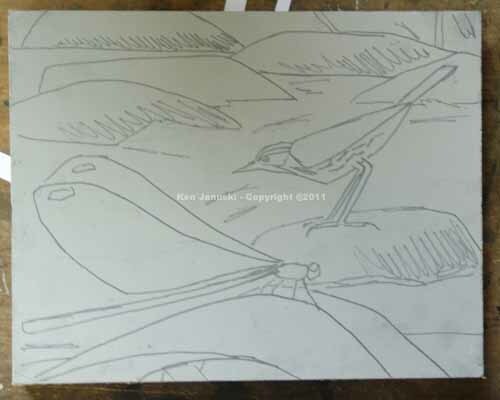 As threatened I began a new linoleum block print today based on the charcoal and pastel drawing of Louisiana Waterthrush and Ebony Jewelwing that I showed in last post. 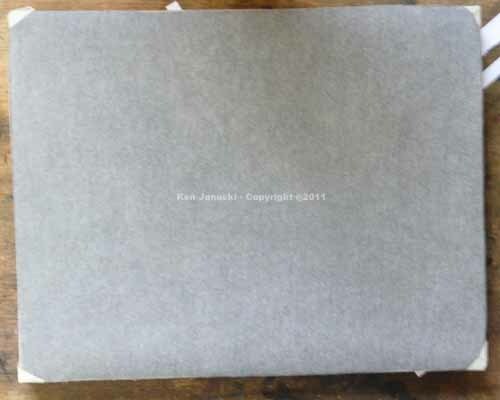 The photo above shows the block itself after printing the first six versions. It's sitting on a homemade bench hook with some of my carving tools next to it. I decided some reader(s) might be interested in seeing much of the process involved so I decided to document it here. The first thing I did was to edit the last photo of the finished charcoal so that it was reversed horizontally. I need to do this because the lino prints in reverse. So I need to reverse my template if I want it to come out correctly. After that I crop the photo so that it is the same proportion as my linoleum block. The drawing and block were almost identical in proportion but not quite. After that I change the image size to the same size as the block and then I print it. 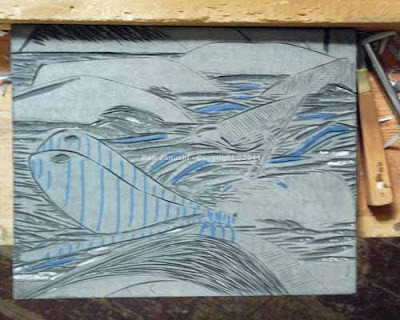 At that point it's time to tape the tracing paper to the linoleum block as above. 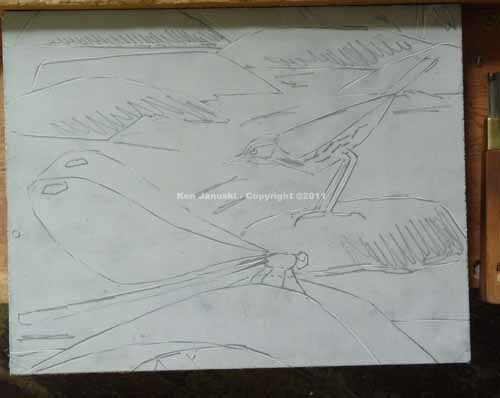 Then, as above, I tape the printed photo to the block, on top of the tracing paper. Then I trace the lines of the major shapes in the photo. So now it's finally time to carve. I like bold prints. But I start out very tentatively, making fairly faint lines. 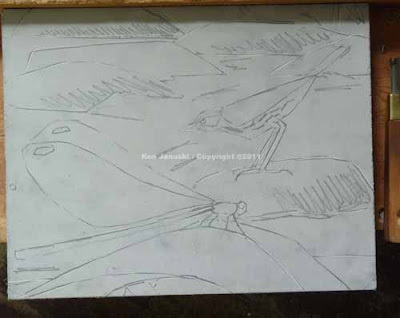 I do this because I can always carve deeper lines but I can never get back the linoleum once it's carved away. It's no great surprise that the first print I pull is a disappointment, like the one above. But I'm prepared for this. It happens every time. I suppose it is a type of delayed gratification. I know that I need to be tentative to start and live with the disappointing prints. By the time I get to version three, above, the print is starting to take shape. There is enough there for me to react to it and to make plans as to how to move on. Version six, probably the last version for today, is above. It's organizing itself pretty well but I will still need to make some major decisions. How much black will I leave, how much white, how much of some in-between tone and just how will I achieve it using just black ink? I guess I'm all colored out. First the dull brown Common Nighthawk, now this black and white charcoal and pastel of a Louisiana Waterthrush and Ebony Jewelwing seen along the Wissahickon in Philadelphia recently. Actually the motivation was more that I've been thinking about a new linocut and exploring various compositions. Though I have done multicolor reduction linocuts it's a whole lot easier to stick to just one color. Since I've seen both Louisiana Waterthrushes and Ebony Jewelwing damselflies at the same spot on the Wissahickon recently a composition featuring both of them has been knocking around in the back of my mind. Rather than go directly to linoleum block with this I thought I'd enjoy trying it first in charcoal. 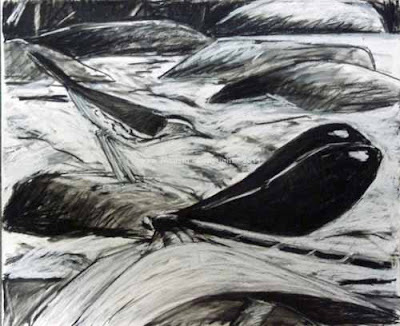 This used to be my primary medium, both as an abstract artist and for awhile as a wildlife artist. So it seemed like it might be a good idea to return to it for awhile. The only problem is that I've finally used up all of my erasers that were able to erase right through compressed charcoal back down to the white of the paper. And I haven't been able to find them anywhere. So here in order to get back some white I added white pastel. As you may notice it has a bluish cast that is different from the warm ivory of the paper. But that's the way it is. Artists are good at adapting. Once you decide that you're going to use birds as a subject in art you have another important decision. What do you do with the background? This is something I've struggled with since I began. 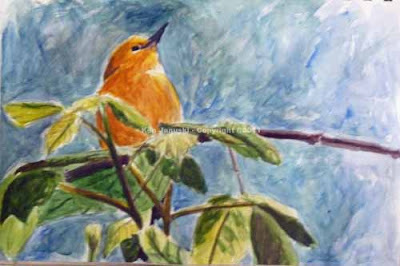 The main options seem to be: 1. standalone portrait, with no real background; 2. portrait with impressionistic background, just enough to indicate some sort of believable environment; 3. painterly style, where the brushwork unites the bird and background, but there is no recognizable natural background; 4. photorealist background where everything, bird and environment is done in detail like a photo; 5. naturalistic background, where the background is recongnizable but it doesn't at all look like a photo as in much 19th century wildlife art. There are all sorts of variations on this. A great personal discovery for me was bird and flower painting. Not exactly realistic but certainly naturalistic this style also has the very appealing trait of combining bird and environment. I'm not claiming at all that this new charcoal is in that tradition. But I think it does share a kinship with it in placing importance on bird and environment. 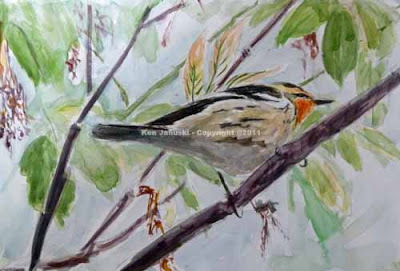 In fact that's why I've often added butterflies, dragonflies and damselflies, as well as turtles to my bird paintings. They are often right there in the same environment. Including them is both true to nature and allows for a lot of compositional experimentation. I don't have the time to check right now but my recollection of Audubon is that this is also something that he often did. For someone who knows nature I hope it adds to the enjoyment of the work. For someone who doesn't I hope that the compositional complexity adds to the enjoyment of the work. For me it does both. "and do so with such regularity that country folk once believed that the birds were seeking to take their animals' milk and accordingly gave them the wholly inaccurate alternative name of goat-sucker." I had often wondered as I looked through my bird guides why there was a family of birds called 'goat-suckers'. Now I know. After I'd read this the other day I remembered that, coincidentally!, I'd gotten a couple of decent photos of a Common Nighthawk at Magee Marsh last May. After painting so many of the colorful wood warblers it might be a nice change of pace to do a quick sketch of the cryptic brown form of this bird. My feeling about watercolor is I'd guess similar to what some people might have about ice-skating. It can be the most graceful and beautiful medium in the world. Or it can be a colossal flop, no pun intended. The only way to get good with watercolor I believe is to keep at it, especially as a sketching tool. Precise but lifeless watercolors seem like just that: lifeless. I prefer watercolors with fluid brushstrokes, like Winslow Homer or so much Asian brush painting. So sketches like this give me a chance to practice, to try to become adept and fluid with watercolor and the watercolor brush. The next time I try a more finished watercolor all the fluidity might well disappear. But there's only one way to prevent that: keep practicing. So this seemed like a good excuse. And also a good excuse for one of my favorite titles: The Goat-sucker Coincidence. I've been continuing to do small watercolor studies of some of the warblers we saw at and around Magee Marsh NWR during The Biggest Week in American Birding. I was looking through some of the photos I took and noticed one where you really couldn't see all that much of the orange of the Blackburnian. There was also a bit of orange in some of the surrounding foliage. So I decided to do a small watercolor based on that. We also saw a number of Prothonotary warblers. I got one field sketch and a number of photos. One thing we both noticed in viewing them is that sometimes the yellow of the head and chest almost looked orange, almost as orange as a female Blackburnian. That's what I've emphasized here. We also got some good looks from above. That shows the extremely beautiful gradation of olive green on the back as well as the black and blue of the wings. So there may still be another watercolor showing that. There's also a nesting Prothonotary about 20 miles from here so I may make an attempt to get out and see and sketch him soon. As I said these are just sketches. They're also on the Stillman and Birn Gamma sketchbook paper that I mentioned earlier. It's not made for extensive washes. And it does buckle with that much water. But it's amazing how much paint it will still take. It's really a great paper for watercolor studies like this. I do want to do some more ambitious work with warblers. Pastels, larger watercolors, prints? I'm not sure which. But I'm working my way in that direction. Well if you coughed up your coffee or tea while reading the subject line I don't blame you. It seems like a bit of an oxymoron. Let me just say that I'm tooting with the horn of the Red-breasted Nuthatch, not the White-breasted Nuthatch. Hopefully the tooting sounds like it's coming from a toy trumpet not a real one. Early this year I read about the 'BBC Wildlife Artist of the Year' competition. A number of my online artists friends have won awards there. So I thought, why not? I applied in the International Artists Category. 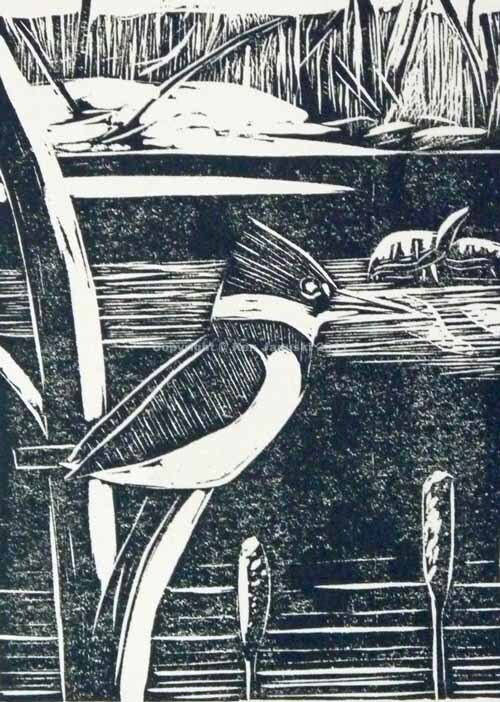 In early May while at Magee Marsh seeing all those warblers I checked my email and found that my linocut 'Belted Kingfisher, Painted Turtles, Snow' above was a finalist. What a nice surprise in an already eventful week! Unfortunately I never got the second email that said I'd won. Winners will be announced soon but I'm sure my name will not be among them. Still it's an honor to reach the finalist stage. I'd decided to add something about it to my blog profile today so checked the web site. 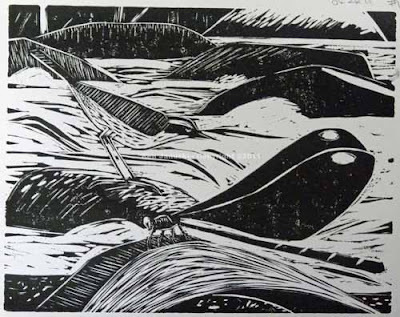 What a treat for all nature and art lovers to find this gallery of artwork done by artists on the island of Sark in association with The Artists for Nature Foundation. Over the years here I've mentioned my difficulty with 'wildlife art'. So much of it seems stilted or stale. It never reflects the liveliness of nature itself. But that's rarely the case with any of the art I've seen that's done on a ANF trip. It always reminds me of why and how art based on nature can be just as exciting as that done by any artist using any other subject or technique. So I really enjoyed going through the slideshow at the BBC link above. I think it shows some very good art based on nature, in a variety of styles. If you explore a bit you'll find other links about Sark, BBC Wildlife magazine itself, Artists for Nature Foundation and a photo of artists on bicycles. Doesn't that sound appealing?! Hopefully this digression in praise of the gallery will allow me to qualify my tooting as discreet. 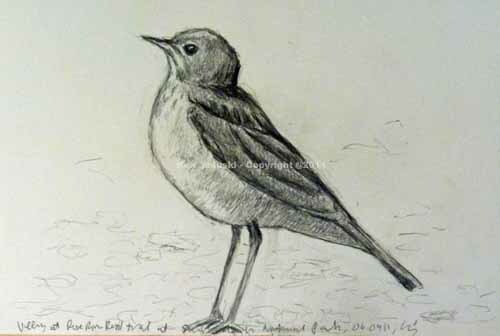 I've finished my fairly detailed sketches of local thrushes. A Hermit Thrush, seen amidst Gill-Over-the-Ground in our backyard this spring. And below a Wood Thrush, seen at Carpenter's Woods a few years ago. Unfortunately I don't have any photos of Wood Thrush on the ground so I had to use this photo instead. 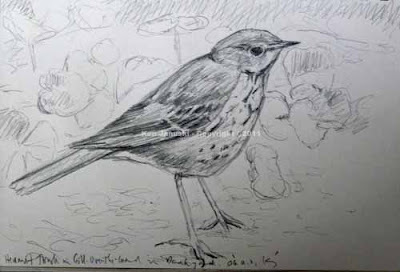 It would have been nice to show all the local thrushes on the ground. Of these four thrushes only the Wood Thrush and the Veery are likely to be found in Philadelphia at this time of the year. But the Hermit, and possibly the Swainson's as well, can be found in more northern parts of the state. Part of my reason for doing this was the hope of familiarizing myself with the various thrush species so that when I find them while birding I'll be able to do better field sketches. Of course I'm not sure at all if such a theory holds true. My guess is that more likely I just learn a little better how to copy a photo. It made no difference today though. My wife and I took part in the Schuylkill Center for Environmental Education Breeding Bird Survey, something we've done for years. But we didn't see a single thrush, only hearing one or two Veeries. I'm sure I'll be seeing both Veeries and Wood Thrush soon at the Wissahickon soon though. Now that most of the migrant birds have passed through and only breeding birds remain it's time to continue to improve my skill in drawings some of our natives, old friends like the thrushes and the flycatchers. This time of year there is a tremendous amount of foliage on the trees and shrubs. If I go out walking early in the morning I'll hear all sorts of Wood Thrushes, Veeries, Acadian Flycatchers and Eastern Wood Pewees. But seeing them is another story. If I do see them I know that most likely it will be for a very short time. So I sometimes get the bright idea that if I also do some drawings of these species from my photos I might have an easier time with quick field sketches. I really don't know if this works in practice at all. I had another reason for trying some drawings from photos today though. I briefly mentioned my new Gamma series sketchbook from Stillman & Birn in my last post. Michael from that company left a comment. But I really haven't used the sketchbooks as much as I'd like. So today seemed like a good time to try some pencil drawings in the sketchbook. I also wanted to test another product that I haven't used as much as I'd like: a Caran d'Ache fixpencil. This one is the smaller 2 mm. one. I normally don't work this way, trying to copy what I see in front of me in the photo, filtered by experience of the actual bird. An example of this is a shadow on a bird in a photo. Tim Wootton gives a good example of this in his new book. The photo shows a line on the face of a bird. But experience tells you there is no such line. It's just a shadow. Sometimes it's easy to get seduced by the trancelike copying of the photo. You always need to keep your wits about you! 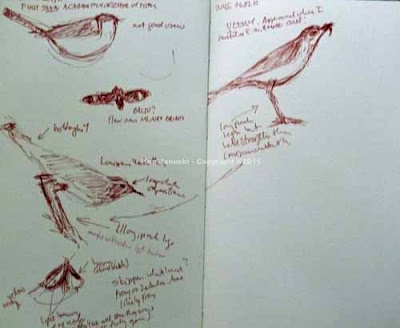 In any case two of the drawings are above: a Veery seen at Shenandoah National Park 4 years ago, and a Swainson's Thrush seen at Magee Marsh just a month ago. 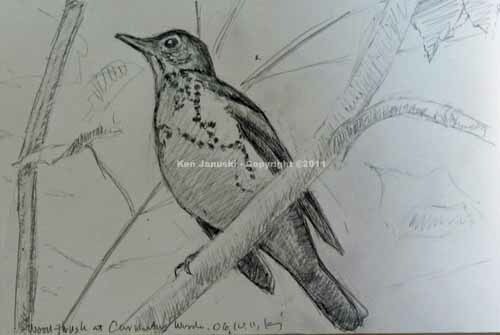 I hope that these drawings will help me with quick field sketches of thrushes next time I see them in the field. Only time will tell. But what about the new sketchbook? Well I have to say I'm impressed, especially for this type of drawing. I did all sorts of erasing and yet you can hardly tell. It's a pleasant surface to work on. And it's nice to be able to erase and still have a clean, almost pristine surface. My previous sketches on it have been mainly quick sketches that were then covered with watercolor washes. This isn't really what the Gamma series of paper is designed for. But it did take a good number of washes without problem, just buckling some. My guess is that I need a different series for using washes like this. But for straight pencil, especially this type, where there might be a lot of erasing I was really impressed. And I was also impressed with the way my new fixpencil worked. It's about out of lead though so my next adventure will be seeing if I can figure out how to change it. I already broke off the eraser accidentally when trying to access the lead when I first got it. Who ever thought a pencil could be so complicated? I do like the way it makes marks though and the hefty feel can't be beat. I've rarely spent time doing product reviews on my blog. But when I do try new products it seems only fair to both companies and readers to at least say what my experience has been. I realize that when I put 'long legs' in the title of a post that I'll probably draw some readers who are expecting something other than birds. But I'm doing so because the first thing I thought when seeing the two birds pictured above this morning was: they have long, pink legs. 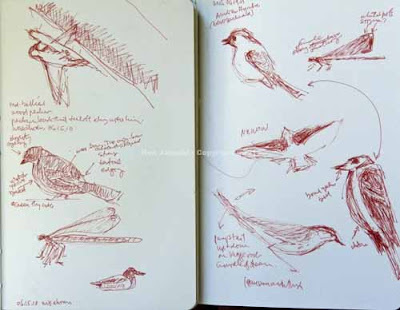 Above are the actual field sketches from this morning at the Wissahickon. Included are the two birds with long, pink legs, a Louisiana Waterthrush and a Veery, as well as an Acadian Flycatcher, a bird in flight that might be a Baltimore Oriole and a skipper butterfly, most likely a Fiery or Zabulon Skipper. The more I bird, and sketch, the more I realize that the legs, where they're placed on the torso, and the way that they're held have a lot to do with identifying birds. Often birds take typical postures. And often they have noticeable legs. Not all that many have long, pink legs. But here they both do. And yet how different they are. 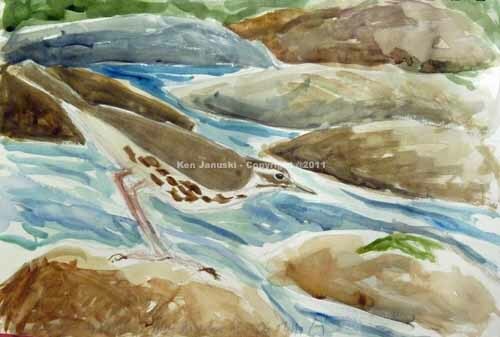 The waterthrush always has bent legs, rump almost straight up in the air, head pointed down. In contrast the Veery, and some other thrushes, seems to use his legs to stand taller and straighter. The pose I drew almost looks wrong, like a Veery that's been stretched out. But that's exactly what he was doing, possibly alert for danger. 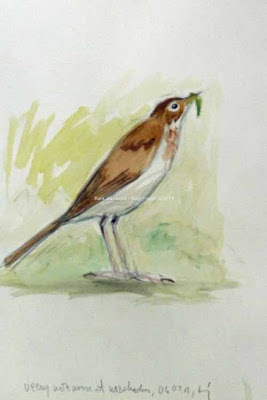 In any case after I'd done the second field sketch of the Veery I knew I'd like to do a post, and perhaps paintings, that talked about legs on birds. So the watercolors at top are both based mainly on the field sketches I did today. I also looked at some of my photos but ended up sticking with the sketches because they were truer to what I actually saw. They're done on paper from Stillman & Birn, in their Gamma series sketchbook. I succumbed to some advertising on what good sketchbooks they made and bought one. This one really isn't meant for washes but it will hold up to light ones. For that purpose I'm happy with the sketchbooks. The paper is a bit higher quality than what I normally use for sketches and that was the reason I decided to try one of their sketchbooks. I prefer to sketch on good paper if I can afford it. So far I'm happy with this sketchbook but still need to test it a bit more. I went back into my Kildeer and Wood Ducklings watercolor yesterday. It was the same day I received a new tube of white gouache. Well I got carried away with it. I don't like to use gouache because it's so easy to turn a transparent watercolor into a more opaque watercolor something more like acrylic or oil. But that's what happened yesterday. There's nothing wrong with gouache and many a justly famous artist has used it in their watercolors. Sometimes it's the only way to save a painting. But I still long to be a master of transparent watercolor! The way that transparent watercolor captures the sense of light, when masterfully used, just can't be beat. This is an unfinished watercolor, about 11x15 inches on Arches cold press paper. It's based on fieldsketches, shown below, that I did at Morris Arboretum yesterday. 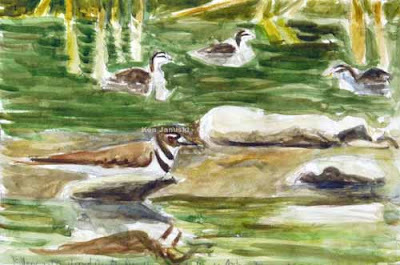 As I was drawing the kildeer through my spotting scope, a number of very young Wood Duck ducklings paddled by behind him. So eventually I also sketched them. 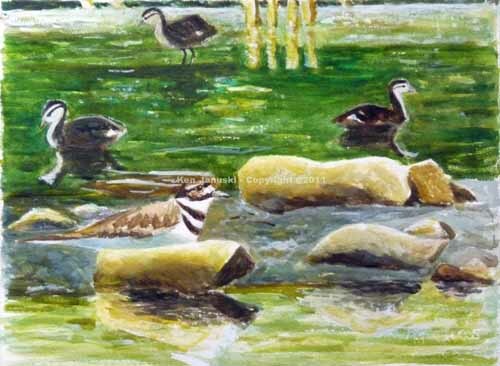 As soon as I saw the ducklings I knew I'd like to combine them with the kildeer in one painting. 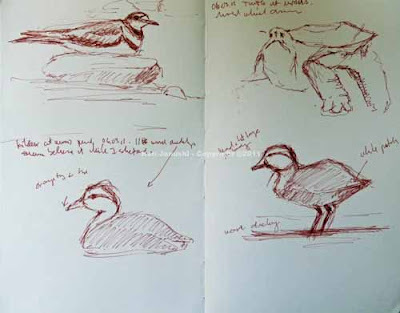 That's one of the pleasures of sketching in the field I think. You're always seeing something that strikes you. All you need is the courage to try to put it down on canvas. Of course skill is needed as well. But in some ways I think it's the courage to even try that is more important. I don't want this to be another art-related post but I do just want to point out how different this process is from the one I used as an abstract artist. Finding a subject was hard work. That is not at all the case with working from nature. There's always something there. I also did a quick pencil sketch yesterday which was my first attempt at combining the ducklings and kildeer.it is below. Obviously I also added some watercolor. It reminds me of the quick 15 minute watercolors I used to do. Like those it's a good way to try out ideas for a larger more finished work. I'm not sure how much more work I'll do on the work at top. I'm sure that there will be some, probably trying to unify the colors and values a bit more. One downside of taking a vacation is that when you return home the rhythm of the natural world, if not other worlds as well, is off kilter. We left for Ohio in mid-spring. When we returned various obligations, tropical heat and rain kept me out of the field. When I finally returned to birding today something was wrong. The spring migration was missing. Where were the migrants? I'm still in migrant bird mode, not breeding bird mode, searching trees and shrubs hopelessly for migrant warblers. All I could find were a few breeding birds. One of them included the mystery bird at top. What is it? What in the world is it doing? 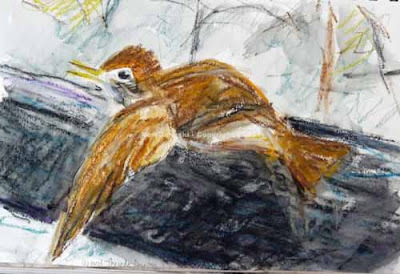 I quickly realized that it was a Wood Thrush, drying itself on a log. It lay flat, wings hanging out and down the side of the log, the tail flattened against it as well. Its torso looked far too short and its head to0 peaked. But I think this can be attributed to the fact that it was wet(thus the punky hair) and it was lying flat. So what normally looks like a long, sleek bird looked small and round. This reminded me though of one of the pleasures of birding with breeding birds. If you have the patience to just see what is happening there are a lot of surprises, particularly birds calmly going about their business. My guess is that the late hour of day(noon) and dearth of birders had put the birds less on guard. Carpenter's Woods had become theirs again. In any case it reminded me of one of the things that I do enjoy about birding in the summer. You get to become more acquainted with your local breeding birds. As far as the sketch here well it's a far cry from the last one of the Black-throated Green Warbler. That was based largely on some photos I took. I'm always bothered by that, like I'm cheating, though that's not really the case. In today's case I assumed that the thrush wouldn't stay that way long. 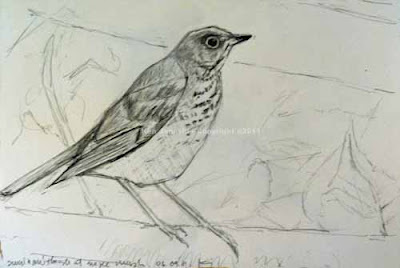 I feared that every time I raised up my binoculars to take another look before committing a line to paper that the thrush might move. As I held my sketchbook in one hand as well that meant each time I raised my binoculars to my eyes I also raised my sketchbook. Much too much flapping movement not to spook birds. But I did get a cartoonish sketch that at least captured the moment. 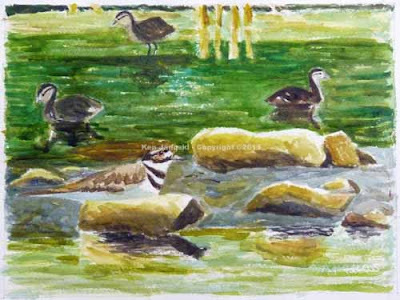 This is another sketch, in pencil and Caran d'Ache Neocolor II crayon and wash, that is based on the field sketch. There was no reason to use the crayons other than to continue to experiment with them. With such an odd pose, that doesn't look believable even when it's right in front of your eyes, there's a temptation to think it would have been good to have a camera and take a photo. But my experience is that it's better to get a quick, even if cartoonish, sketch based on direct reaction to what I saw than to get a photo which might be even harder to puzzle out. At least in drawing it live I have to puzzle out what I'm actually seeing. So I'm happy that I stuck with a field sketch for this. There's a lot to be desired but I think it does capture the moment, at least for me. So what about philosophy and geology? Well ever since I read the cover story in the new 'The Economist' I wanted to respond in some way. Breeding bird behavior sort of led into the article. One of the pleasures of learning about breeding birds is that you feel that you're adding to your knowledge of the natural world, a world that is larger and often more profound than the day to day human world, certainly the human world that is evident in news headlines. Knowledge of the natural world gives an interesting perspective on quotidian concerns. This is especially true when it comes to geology. It covers such a huge time span that most human activity seems insignificant in the face of it. We tend to forget ice ages, extinctions, continent dispersal and realignment. No one, well almost no one, is worried about the North American continent splitting up and how that might effect government entitlements. We think on a much smaller time scale. Geologic scale and time is nearly incomprehensible to humans. But there is something comforting about it. As with nature in general there is the realization, at least for me, that the world is much larger than the one I spend my daily life in. Man himself has been around for a very, very short time. So some theorize that the new geologic age is one in which the predominant factor is man himself. That is scary and it does, at least to me, question the nature of 'nature.' Man has long had a history of subduing nature. And at this point in history it's hard to objectively separate out the good from the bad and come up with an honest assessment. I dislike much of the destruction of nature that I see. But I also recognize that there has been progress. But it's never been on such a scale. The article mentions a tar sand mine that physically moves twice the amount of sediment moved by all the world's rivers in a year. Do I really want someone I don't know, who is most probably more interested in profits for himself than anything else, to be messing with the earth at such a level? Not exactly. The authors are much more sanguine about this and seem to think there's no way around it anyway, given the increase in human population. These are all very large questions. I don't have the answer. But I think the article is worth reading and thinking about. The nature of nature seems to be changing and no one's in charge.